I love cats. I have lived with them nearly all my life and hope at least one cat will always own me. 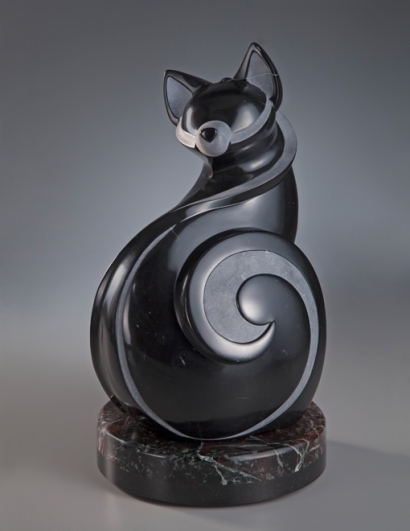 “Feline improvisation” is a stone sculpture inspired by my tuxedo cat, Smoochie. She has generous proportions, a sweet disposition, and fur softer than silk. Guitar music and jazz are my favorite kinds of music. I listen to my husband, Brian Wendt, play acoustic guitar every day. I listen to KUVO, Denver’s jazz radio station, when I am doing the hand finishing on my sculptures. Experiences collide and sculptural ideas happen. Cats have long bones and muscles that give them luxurious forms. Their bodies are extremely flexible and graceful, even when they are asleep. I was thinking about the long lines of action in a cat’s pose—how an entire cat can be simplified to one long, sinuous line that curves and undulates from ears to shoulders, through the body, and eventually to the tip of the tail. I have extensive knowledge of cat anatomy, behavior, and moods both from living with them and from animating them. Familiarity gives me the confidence to take liberties with cat forms to express how I feel. Musical improvisations start with a melodic theme, and then the musician departs from the rigidity of the song and takes the listener through audio curves and undulations to express his or her feelings. Jazz music is a fun adventure in listening, jazz sculpture is an equally fun adventure in looking. So many aspects of stone sculpture delight me. I love how stone feels. A raw stone feels good; a carved stone feels like a magic talisman. A carved and polished stone feels like some wonderful alien thing. Finished stone looks soft even though it is hard stone if you keep interior lines to a minimum and only describe the forms with shapes, rather than lines. Polished stone feels soft if you take it to a very high shine. “Feline Improvisation” is polished to 10,000 grit using a mixture of black wax and tin oxide, and feels as silky as Smoochie’s fur. The light grey linear shapes are raw textured marble. The contrast provides a path of action for the eye to travel through the sculpture, clarifies the forms, and offers visual relief from the shine. I think I invented this term to describe the events that happen to primordial muck as it is heated and compressed into stone over hundreds of millions of years. Chinese Black Marble is littered with thousands of tiny fragments of broken seashells, so I deduce that the swampy mud and water was churned up for long periods of time breaking up all the shells. It has a jazzy, active look to me. Some black marbles, like Mongolian Imperial Black, have fossils of whole sea snail shells intact within the stone matrix, so I figure Mongolian was formed in fairly stagnant water. This marble has a regal, elegant look to me. Most black marbles have concentrated layers of crushed seashells that form a dense white layer where no carbon (black) is present. We stone sculptors call this white line—I know, high-tech language. You can see some white line across the cat’s left ear. I think of geologic serendipity as stone improvisation. The variety of inclusions and geologic events produces a sort of theme for each kind of stone. Nature is the improviser. We are part of the adventure of discovery on a timeline tracing millions of years. The fun is in the looking. I worked with master photographer Mel Schockner to create this image of “Feline Improvisation.” Mel is a wizard of lighting, the brains and eyes behind this sensitive and smart beauty shot. I was the hands and feet. Mel recently had surgery on his ankle to relieve an old injury, but generously offered to shoot the sculpture if I could follow his directions to fetch, set up, and adjust lights, diffusers, and filters. Enlightening! Photographing shiny sculptures is the art of creating highlights. If you look at the image, you can see how Mel composed the highlights in the cat’s forms so that the shapes read due to the shapes and placement of the highlights. Basically, he created the rhythms of the sculpture in shine. Brilliant! I learned many lessons in the creation of “Feline Improvisation.” One of the most rewarding was working with Mel, like being inside his brain to understand his creative choices. A fun revelation!